In 2002, the Sacramento region faced a prospective future of worsening congestion – a projected increase of over 50 percent by the year 2025 – and increasingly worse air pollution based on current land-use patterns, transportation funding levels, and transportation investment priorities. To attempt to solve these challenges, the SACOG Board of Directors initiated the Sacramento Region Blueprint Project, an extensive study of the linkages between transportation, land use and air quality. The philosophy behind the regional visioning process was that planning and design choices made by a community have many impacts on regional development patterns, modal choices, infrastructure costs, redevelopment potential, natural resources, and other aspects of livability. 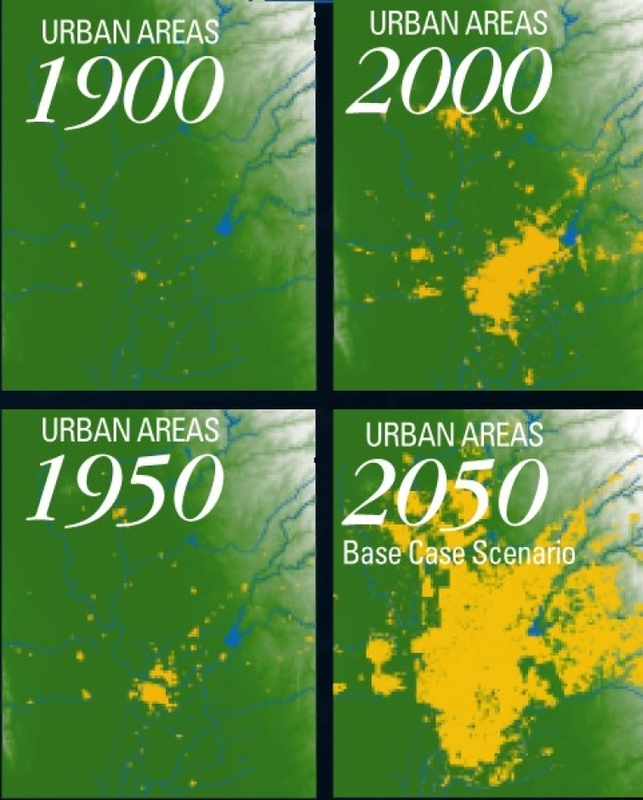 By being aware of the consequences of their community’s development choices, citizens can improve their economies, environments, and quality of life. If communities work together at this process, then these positive affects can be seen regionally. As its core goal, the Blueprint Project aimed to support local governments with high quality data and modeling tools so that decisions regarding future growth and its affects on quality of life issues such as traffic congestion and air pollution could be made with the best information available. In addition to developing detailed land-use and travel data, an extensive community outreach effort was conducted to develop and assess guiding principles for the region’s long-term growth. The learnings from the regional visioning process would also be used by the Board of Directors of the Sacramento Area Council of Governments (SACOG), the region’s transportation planning and funding agency, to make choices about what transportation projects will best serve the region as it changes. Through its public outreach and education component, a wealth of technical data for local decision makers, and funding for “smart growth” development, the Blueprint provides a tangible opportunity to help make Sacramento as attractive tomorrow as it is today. The Preferred Blueprint Scenario for 2050 was adopted by the SACOG Board in December 2004 and is a result of numerous public workshops and meetings with local government staff and elected officials. It should be interpreted and used as a concept-level illustration of the growth principles. It was developed with parcel-level data and analysis to help ensure that the growth concepts were being applied in a realistic manner; however, it is not intended to be applied or implemented in a literal, parcel-level manner. Seeking broad input from the ground up, SACOG and partner Valley Vision launched a series of 37 workshops in neighborhoods, cities, and counties throughout the region in 2003. The Blueprint workshop series began at the neighborhood level. Each city or county hosted one workshop in their area highlighting two or more case study areas. Citizens worked in small groups performing interactive planning using computers and table maps. The computer program modeled the impacts of choices made in a “what if” type exercise. 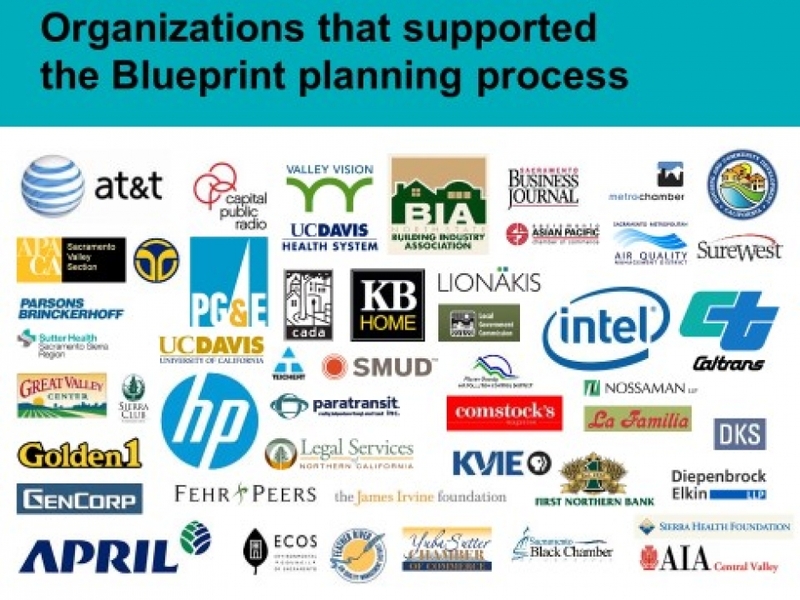 The starting point for Blueprint was a “Base Case Scenario,” a projection of how the six-county Sacramento region would grow if recent development trends continued for the next 50 years. The region that includes Sacramento, Placer, El Dorado, Yuba, Sutter and Yolo counties will remain an attractive place to live and will grow dramatically. 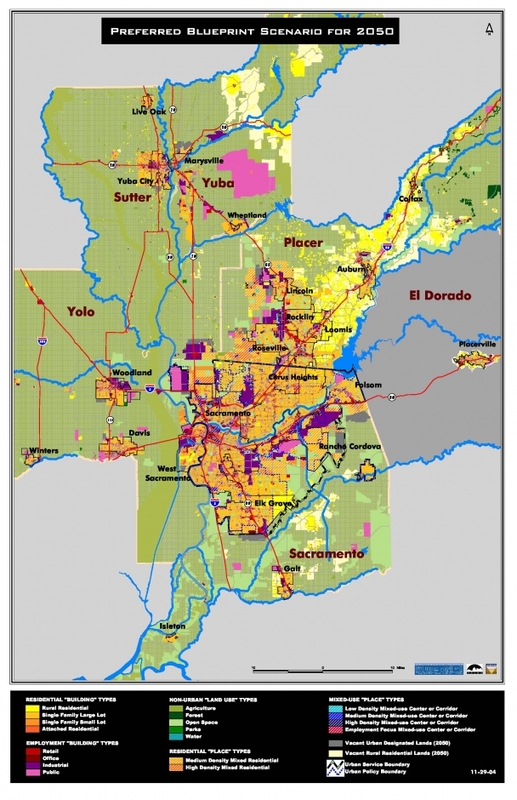 One of the most startling figures to arise from the study is that there will be an estimated 1.7 million more people in the Sacramento Region in 2050 than there were in 2000. The Blueprint Project has been honored with several awards from national, state and local government agencies, organizations and businesses.